The Xbox One is getting a major update later this year that'll bring an all-new user interface to the console. 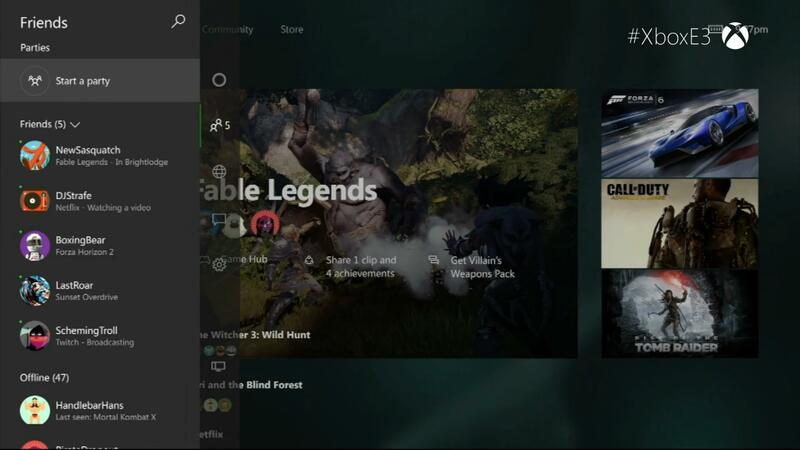 Microsoft gave a short preview of the new interface as part of its bumper crop of E3 announcements and it's already looking pretty slick. Describing the new UI, Richard Irving of the Xbox engineering team said that the first focus was to make it fast: seeing updates from friends, sharing content, finding out what's new, and jumping into games should all be quickly accessible. A new panel that's always accessible through a double tap of the Xbox home will give instant access to notifications, messages, friends, your party, and a handful of quick settings. This pane won't just be accessible in the dashboard, it'll also be available in games and will appear without impacting the game's performance. The main dashboard discards the tiles of the current interface, for the most part. The entries for recently-used games and apps show who's playing and give you quick access to things like patch information. Only if you scroll to the end of the list do you find something more tile-like, for your pinned items.